Antonin Artaud was born in Marseille, France, to a family of Levantine Greek origins. He became a playwright, poet, essayist, actor, and theatre director, despite many hospitalizations for mental illness, and is considered one of the major figures of 20th-century avant-garde theatre and literature. His work influenced the Theater of the Absurd, particularly the works of Jean Genet, Eugène Ionesco, and Samuel Beckett. Allen Ginsberg claimed that Artaud's radio play "Pour en finir avec le jugement de Dieu" (To Have Done with the Judgment of God) had a tremendous influence on his most famous poem, "Howl." Antonin Artaud is currently considered a "single author." If one or more works are by a distinct, homonymous authors, go ahead and split the author. 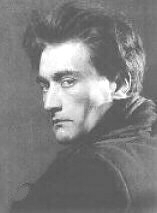 Antonin Artaud is composed of 16 names. You can examine and separate out names.